Published: May 1, 2016 at 03:28 p.m. Updated: May 5, 2016 at 08:44 p.m.
After rescinding the franchise tag on Josh Norman, Carolina Panthers general manager Dave Gettleman said optimistically that "sometimes the answer is on your roster" in regards to filling out a position of need. And sometimes you must draft to find that answer. The Panthers used three of their five selections in this week's NFL draft on the corner position, ostensibly to try to help fill the void left by Norman. Carolina took cornerbacks with three consecutive picks on Friday and Saturday: James Bradberry, Samford, second round; Daryl Worley, West Virginia, third; Zack Sanchez, Oklahoma, fifth. Even before Norman's departure, the Panthers needed to rebuild their secondary depth. Gettleman did so with the bulk of his draft picks this season. Four of the Cardinals' six draft picks were on defensive players. Last season, the Cardinals ranked fifth in total defense (321.7 YPG). Arizona had 36 sacks last season (T-20th in NFL). Pick Fact: Round 6, Pick No. 205 -- CB Harlan Miller (Southeastern Louisiana). Miller becomes the fourth defensive back and ninth player to be drafted from Southeastern Louisiana in the modern draft era. Three of Atlanta's first four draft picks were defensive players. The Falcons ranked 20th or worse in total defense in three of the last four seasons (in 2015 they ranked 16th). Pick Fact:Round 3, Pick No. 81 -- TE Austin Hooper (Stanford). Hooper is the sixth tight end drafted out of Stanford since 2000: Austin Hooper; Zach Ertz; Levine Toilolo; Coby Fleener; Jim Dray; Alex Smith. The Ravens made five selections in the fourth round, the most fourth-round picks in the common draft era. On offense, Baltimore drafted two tackles including Ronnie Stanley. Last season, the Ravens allowed 24 sacks (third-fewest in NFL). Ravens had a balanced draft selecting five offensive players and six on defense. Pick Fact: Round 4, Pick No. 132 -- DT Willie Henry (Michigan). Henry played under Jim Harbaugh at Michigan and will now be coached by John Harbaugh. Pick Fact: Round 6, Pick No. 182 -- WR Keenan Reynolds (Navy). Reynolds is the seventh player from the Naval Academy drafted since 1967. The Bills' first three players drafted were all defensive players. After leading the NFL in sacks in 2014 (54), the Bills fell to 31st in sacks in 2015 (21). Rex Ryan has used his last seven first-round picks on defensive players. Mark Sanchez in 2009 is the only offensive player selected by a Ryan team in the first round. Pick Fact: Round 4, Pick No. 139 -- QB Cardale Jones (Ohio State). There have been 11 previous QBs drafted from Ohio State before Jones. Not one made a Pro Bowl. Four of the Panthers' five draft picks were defensive players. Dating to Luke Kuechly in 2012, the Panthers have selected a front-seven defender in the first round in four out of the last five drafts. Pick Fact: Round 2, Pick No. 62 -- CB James Bradberry (Samford). Second straight year a Samford player goes in the second round -- Safety Jaquiski Tartt went No. 46 last year to the Niners. The Bears used six of their nine picks on defensive players. Last season the Bears forced just 17 turnovers (28th in the NFL) and had a scoring defense ranked 20th or worse in each of the last three seasons, 2015: 20th; 2014: 31st; 2013: 30th. Pick Fact: Round 2, Pick No. 56 -- G Cody Whitehair (Kansas State). Highest drafted player from Kansas State since Josh Freeman went NO. 17 overall to the Buccaneers in 2009. Bears have drafted only one other guard in the first two rounds in common draft era: Kyle Long (first round, 2013 draft). The Bengals drafted four defensive players and three on offense. Of the Bengals' three offensive players, two were wide receivers -- Cincinnati lost Marvin Jones and Mohamed Sanu in free agency. Pick Fact: Round 1, Pick No. 24 -- CB William Jackson III (Houston). Third time in last five years the Bengals have taken a corner in the first round. Bengals allowed 248.5 pass YPG last season (20th in NFL). The Browns drafted more players in 2016 than in 2013 and 2014 combined (11). Cleveland had 14 draft picks, most among any team this year. They used seven for offensive players and seven on defense. Browns made five trades, tied for the most of any team this year (with Miami). Four of their picks were among FBS leaders over the last two seasons: WR Corey Coleman (first round): Led FBS with 20 receiving TDs last season; DE Emmanuel Ogbah (second): fourth in FBS with 13.0 sacks last season; DE Carl Nassib (third): Led FBS with 15.5 sacks last season; LB Scooby Wright (seventh): second in FBS in solo tackles in 2014 (99). Pick Fact: Round 3, Pick No. 93 -- QB Cody Kessler (USC). Since 2011, 41 QBs have been drafted in Rounds 2-7. Five have made at least one Pro Bowl: 2015 sixth round Tyrod Taylor; 2014 second round Derek Carr; 2012 third round Russell Wilson; 2012 third round Nick Foles; 2011 second round Andy Dalton. After selecting Ezekiel Elliott fourth overall, the Cowboys used five of their next six picks on defensive players. Cowboys have ranked outside the top 10 in total defense every year since 2010. In 2015, the Cowboys forced just 11 takeaways (fewest in the NFL). Pick Fact: Round 4, Pick No. 135 -- QB Dak Prescott (Mississippi State). Prescott is the first QB drafted by the Cowboys since Stephen McGee in the fourth round of the 2009 Draft, a streak which tied with Lions for longest by any team since last selecting a QB (2009, Matthew Stafford). Four of the last five QBs that the Cowboys have drafted have been in the fourth round. Pick Fact: Round 6, Pick No. 217 -- TE Rico Gathers (Baylor). Gathers did not play high school or college football -- All-American basketball player at Baylor. The Broncos drafted four offensive players, three defensive players and a punter. Their first two picked address two of their biggest offseason losses -- QB Payton Lynch (lost Peyton Manning and Brock Osweiler) and DT Adam Gotsis (lost Malik Jackson). Pick Fact: Round 1, Pick No. 26 -- QB Paxton Lynch (Memphis). Lynch is the first QB since Tim Tebow to be drafted by the Broncos in the first round. Broncos have traded up for their last two first-round quarterbacks. Lynch, 6-foot-7, becomes the second-tallest QB selected in the first round in the common draft era (since 1967). The Lions drafted five offensive players, including three linemen and a running. In 2015, the Lions ranked last in rushing (83.4 rush YPG). Pick Fact: Round 6, Pick No. 191 -- QB Jake Rudock (Michigan). Rudock is the first Michigan QB drafted since Chad Henne in 2008. The last Michigan quarterback drafted in the sixth round was ......... Drew Henson in 2003 (you thought I was going to say Tom Brady). Of their seven draft picks, two were offensive tackles and two were linebackers. Four of the Texans' six picks were used on offensive players. In 2015, the Texans ranked 19th in total offense (347.8 YPG) and T-21st in scoring offense (21.2 PPG). Two of their first three picks were wide receivers. In 2015, DeAndre Hopkins had 1,521 receiving yards. The rest of the receiver group combined for 1,446 yards. The Texans top two picks (Will Fuller, Nick Martin) attended to Notre Dame. Pick Fact: Round 3, Pick No. 85 -- WR Braxton Miller (Ohio State). Miller was the starting QB for Ohio State when they defeated a Bill O'Brien coached Penn State team 63-14 in 2013. The Colts used four of their eight picks on offensive linemen. No quarterback has been hit more than Andrew Luck since 2012 -- 375 times. The Jaguars used six of their seven picks on defense. Since 2012, Jaguars ranked 24th or worse in total defense every season. Jaguars become the first team to make a top-five pick in each of five straight years of the common (since 1967) draft. Jacksonville selected fifth overall in 2012 (Justin Blackmon), second in 2013 (Luke Joeckel), third in 2014 (Blake Bortles), third in 2015 (Dante Fowler) and fifth in 2016 (Jalen Ramsey). Pick Fact: Round 2, Pick No. 36 -- LB Myles Jack (UCLA). Jack becomes third UCLA player drafted by the Jaguars in franchise history, joining tight end Marcedes Lewis (first round) and running back Maurice Jones-Drew (second). The Chiefs drafted four offensive players and five defensive players. Of those, the only positions they doubled up were receiver and defensive back. Pick Fact: Round 2, Pick No. 37 -- DT Chris Jones (Mississippi State). The last defensive lineman from Mississippi State to go in the first two rounds was Fletcher Cox, who went 12th overall in 2012 to the Eagles. 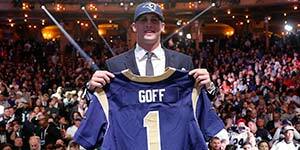 Four of the Rams' five draft picks were on the offensive side of the ball. In 2015 the Rams ranked last in total offense (297.6 YPG) and 29th in scoring offense (17.5 PPG). Pick Fact: Round 4, Pick No. 117 -- WR Pharoh Cooper (South Carolina). Cooper is the fifth receiver taken in the first four rounds from South Carolina in the last decade. Six of the Dolphins' eight draft picks were offensive players. The Dolphins have ranked outside the top 20 in total offense in five of the last six seasons. Six offensive players were the most for the Dolphins since they also selected six in 2012 -- two defensive players were the Dolphins fewest in a draft since 2011 when also drafted two players. The Vikings drafted four players on offense and four on defense -- including two receivers and one tight end. In 2015, the Vikings ranked 31st in passing offense. Pick Fact: Round 2, Pick No. 54 -- CB Mackensie Alexander (Clemson). Alexander did not have an INT in his college career. Pick Fact: Round 6, Pick No. 180 -- WR Moritz Boehringer (Germany). First international player to go straight from a European league to the NFL. The Patriots drafted four players on offense and four on defense. They selected two offensive linemen to help a unit that was often injured in 2015 (Pats used a combined 12 different starting O-line combinations). Pick Fact: Round 2, Pick No 60 -- CB Cyrus Jones (Alabama). Jones had four punt-return TDs this season. Three of the Saints' first four draft picks were on defense. Last season the Saints ranked 31st in total defense (413.4 YPG). Saints ranked 28th or worst in total defense in three of the last four years. Pick Fact: Round 1, Pick No. 12 -- DT Sheldon Rankins (Louisville). Rankins is the fifth Louisville first-round pick in last three years -- only had six from 1967-2013. For the first time in team history, the Giants didn't select a single offensive or defensive lineman with any of their draft picks. Pick Fact: Round 2, Pick No. 40 -- WR Sterling Shepard (Oklahoma). Shepard is the highest drafted Oklahoma WR since Mark Clayton went 22nd overall in 2005. Shepard is the seventh Oklahoma receiver drafted in the first two rounds in the modern era. The Jets drafted a defensive player in three of their first four picks. New York used its eighth straight first-round pick on a defensive player. The Jets have now drafted a QB in four straight seasons. The Raiders' first three picks were all on the defensive side of the ball. Last season the Raiders ranked 22nd in total defense. The Raiders have not had a top 10 total defense since 2006 (third). Pick Fact: Round 4, Pick No. 100 -- QB Connor Cook (Michigan State). Became the fourth Michigan State QB drafted in first four rounds. The last was Kirk Cousins in the fourth round. The Eagles' first four picks were all offensive players. Last season the Eagles ranked 12th in total offense however they finished 30th in total defense. Pick Fact: Round 1, Pick No. 2 -- QB Carson Wentz (North Dakota State). Wentz is the highest-drafted quarterback from a non-FBS school since FBS and FCS split prior to the 1978 season. First signal-caller taken from North Dakota State in the common draft era (since 1967). Steelers used five of their seven picks on defensive players. Steelers finished outside the top 10 in total defense in each of the last three seasons. From 2010-2012, they finished top two including first overall in 2011 and 2012. Steelers have never before drafted defensive players in each of the first three rounds since the modern draft era. Pick Fact: Round 1, Pick No. 25 -- CB Artie Burns (Miami). Burns is the first Steelers defensive back taken in the first round since Troy Polamalu in 2003. Burns is the 13th defensive back selected in the first round out of the University of Miami. Three of the Chargers' first five players drafted were on defense. The Chargers finished 20th in total defense in two of the last three seasons. Between 2004-2012, the Chargers had only finished 20th or worse in total defense once (2008). Pick Fact: Round 3, Pick No. 66 -- C Max Tuerk (USC). Philip Rivers had 661 pass attempts last season, most in the NFL and was sacked 40 times in 2015, second-most of his career. He was sacked 49 times in 2012. Tuerk was the fifth USC offensive linemen drafted in the first three rounds since 2010. Four of the 49ers' first five draft picks were all on defense. After finishing in the top five in total defense every season between 2011- 2014, the 49ers fell to 29th in 2015. The Niners drafted two players from the Pac-12. Chip Kelly's teams have selected at least two players from the Pac-12 every year he's been an NFL head coach. Pick Fact: Round 1, Pick No. 28 -- OG Joshua Garnett (Stanford). 2016 marks the third time in the last five years that a Stanford offensive linemen has been drafted in the first round. The Seahawks selected three offensive linemen, including Germain Ifedi in the first round. In 2015, Russell Wilson was sacked 45 times (T-3 most in the NFL). The 45 sacks were also a career-high for Wilson. Seattle drafted three running backs: C.J. Prosise, third round; Alex Collins, fifth round; Zac Brooks, seventh round. Pick Fact: Round 3, Pick No. 90 -- RB C.J. Prosise (Notre Dame). The last Notre Dame running back picked in top 100 was Julius Jones by the Cowboys in 2004 (No. 43). Three of the Bucs' first four picks were defensive players. Tampa ranked 10th in total defense in 2015 (340.4 YPG), but 26th in scoring defense (26.1 PPG). The Buccaneers ranked outside the top 20 in scoring defense in five straight seasons. Pick Fact: Round 2, Pick No. 59 - K Roberto Aguayo (Florida State). Aguayo is the fourth kicker to go in the first two rounds in the last 25 drafts. Pick Fact: Round 2, Pick No. 45 -- RB Derrick Henry (Alabama). This is the sixth time a team has drafted a Heisman Winner in consecutive seasons. The last team to do so was the Detroit Lions who drafted RB Barry Sanders (1989) and QB Andre Ware (1990). Three of the Redskins' first four picks were defensive players. In 2015, the Redskins ranked 28th in total defense (380.6 YPG). Pick Fact: Round 1, Pick No. 22 -- WR Josh Doctson (TCU). First receiver from TCU to be a first-round pick and first TCU skill position player in first round since running back LaDainian Tomlinson, 2001, No. 5, SD. This is the first time since 2001 the Redskins have selected a wide receiver in the first round (Rod Gardner, 15th overall).